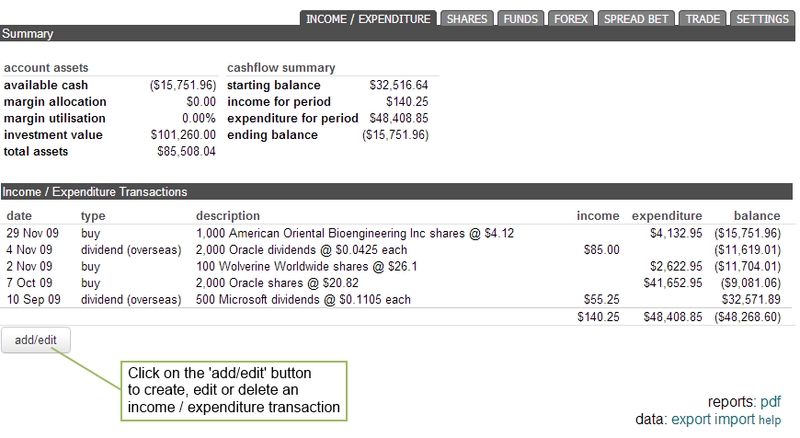 You can use the income/expenditure tab to track all transactions associated with a Portfolio Account. For example if you have a bank account, you could use the income section to enter interest received from your bank and in the expenditure section you could enter any bank charges applied, such as yearly or quarterly account maintenance fees. 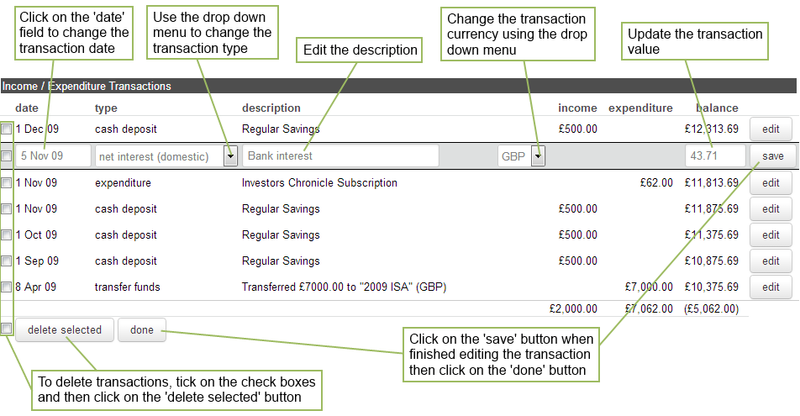 To edit or delete a transaction in the Income/Expenditure tab, complete the following steps. To add, edit or delete transactions, click on the 'add/edit' within the 'Income and Expenditure Transactions' section, and add your entry as illustrated in the following screen shot. When you have made the necessary amendments to the transaction, click on the 'save' button as illustrated in the previous screen shot. You can delete transactions by ticking the delete check boxes and then clicking on the 'delete selected' button; alternatively tick the check box beside the 'delete selected' button to select all transactions for deletion. When you have no more changes to make, click on the 'done' button.